There is nothing better than supporting other artist/makers, especially when they are my friends! Bowl by Quail Pottery. Hand dyed cloth napkin by Flatland Alpacas. This is a throw together, ready in an hour easy vegan chili. 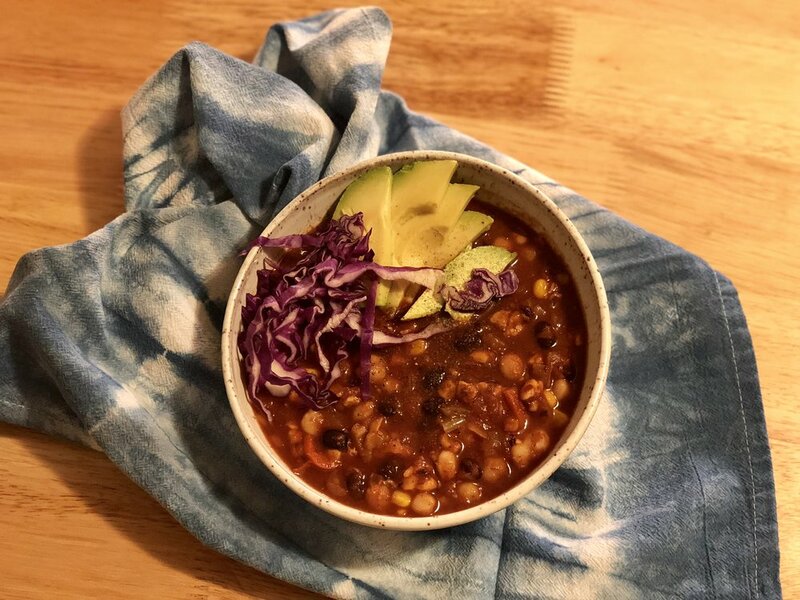 It was inspired by a recipe for pozole, my husband loves from the Thug Kitchen Cookbook (which is a household favorite). It makes a big pot so be ready for leftovers! Saute onion and oil over medium heat until the onion begins to turn translucent. Add garlic and peppers and toss until fragrant. Add spices except cocoa and crumble tempeh and stir until well coated. Add beans, hominy, corn and crushed tomato, cocoa and water. Mix thoroughly and simmer on low heat for 20min-45min (if you have the time, let this simmer for longer, it only gets better with time.) If you like your chili more loose, add another cup of water. Serve warm with garnish of your choice.